Hinshaw, Delmar O., lodger, age 24, born in Oregon; completed 4 years of high school; on Apr 1 1935 was living in Prairie City, Grant County, Oregon; occupation: re-saw man, lumbering manufacturing; worked 52 weeks in 1939; $1100 wages in 1939. Hinshaw, Ellen E.., lodger's wife, age 27, born in Oregon; completed 1 year of college; on Apr 1 1935 was living in Prairie City, Grant County, Oregon; worked 52 weeks in 1939; $660 wages in 1939, plus other income. 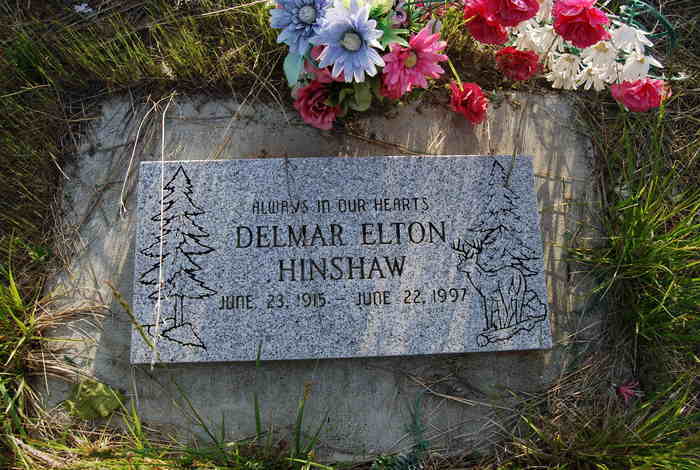 Delmar and Ellen divorced.1,2 Ellen died Apr 15 20011,2 [Apr 16 20016], Providence Hospital, Portland, Oregon1,2; buried Mount Hope Cemetery, Baker City, Oregon1,2. Obituary of Ellen Davis Hinshaw, The Baker City Herald; Baker City, OR; Apr 20 2001: http://www.ancestry.com. Obituary of Ellen Davis Hinshaw. 1920 census, Rosebud Township, Grant County, Oregon; roll T625-1494, ED 60, page 1A, line #40, dwelling #16, family #16. 1930 census, John Day Precinct, Grant County, Oregon; roll T626-1939, ED 4, page 2A, line #43, dwelling #38, family #41. 1940 census, Burns, Harney County, Oregon; roll T627-3361, ED 13-5, page 4A, line #7, household #72. Ancestry Family Tree data "Hulett Family Tree" posted by "hulett57". Obituary of Wilma D. Davis, The Baker City Herald; Baker City, OR; Jan 8 2005: http://www.ancestry.com.